Hip power fins = shinfin™ leg fins = Thighs, buttocks, stomach & torso. Want more speed from big muscles? + Minimal knee-bend, more power. + Power from strong muscle groups. + Thighs, buttocks, stomach & torso. + Smooth power within each stroke. + For freestyle, backstroke & butterfly. + Imprints your kick muscle memory. + Power your barefoot swimming! Fins powered from your hips! Wish fins used your larger muscles? shinfin™ leg fins are hip power fins because they encourage you to kick smoothly from your hips, keeping your knees fairly straight. This is how good swimmers kick. The fins can only do this because they are connected to your legs, not to your feet. Your hip joint is powered by the large muscles in your thighs, buttocks, stomach and torso. These fins actually guide you to use these muscles correctly to enhance your freestyle, backstroke and butterfly strokes. You can feel your hip power muscles working properly (much more than with regular flippers). Have you ever wondered why regular flippers strain your calf muscles? It is because they make you use your calf muscles to kick from your knees, not from your hips. They make you bend your knees too much – you can feel it. They also make you use your calf muscles to point your feet to hold the flippers straight. This strains your calf muscles even more. This all tells you that flipper biomechanics is wrong for natural swimming. That’s why coaches and swimmers often don’t use flippers at all. They don’t want to train the wrong muscles, corrupt their natural kick action and ruin their stroke timing. Do flippers strain your calf muscles? How do flippers ruin your stroke timing? Have flippers messed up your natural freestyle, backstroke or butterfly kicks? To swim properly with hip power, you need your fins on your legs, not on your feet. Would you like to improve and strengthen your technique for freestyle, backstroke or butterfly? Perhaps you need hip power fins to exercise the large muscle groups in your thighs, buttocks, stomach and torso? Maybe you just want to enjoy the feeling of proper hip powered swimming? Read on to learn more. Or contact me. I’d love to discuss how shinfin™ leg fins will help you. For customer testimonials about people getting great power from their hips with these swim fins, please see Hip Power Fins Reviews. 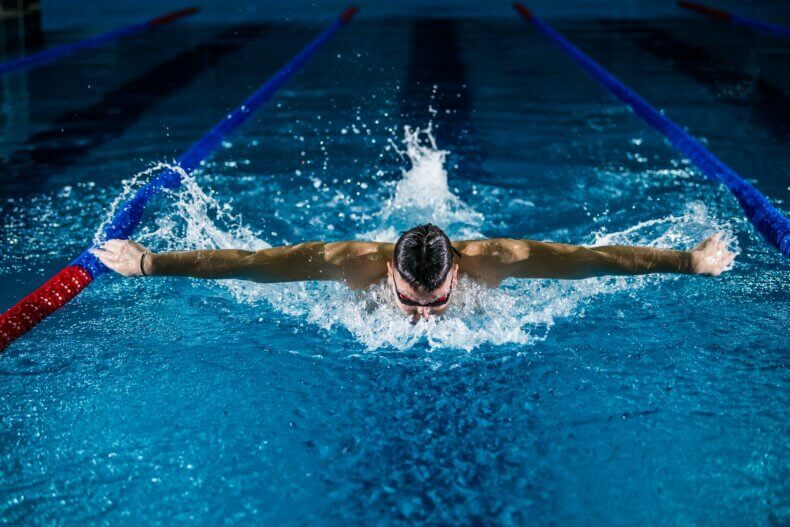 To learn about why these swim fins offer you the best swim style and the best streamlining, please see Benefit 5 – Best Swimming Style Fins and Best Swimming Style Fins Reviews. Please also see Benefit 7 – Streamlined Force Fins and Streamlined Force Fins Reviews.